My first assignment for The Forecaster – Saturday, January 23 at Payson Park in Portland. And almost the last time I felt my fingers (read: it was a really cold day for pressing buttons and taking names). "All aboard a snow raft on Saturday, Jan. 23, at the WinterKids Welcome to Winter Festival at Portland’s Payson Park. WinterKids, a nonprofit whose mission is to help children develop healthy lifelong habits through education and fun, outdoor winter activity, partnered with Portland Recreation and Anthem Blue Cross Blue Shield to put on the event that attracted hundreds of kids and adults." Jason Oliver, Jr., 5, and Jason Oliver, 42, of Westbrook celebrate a successful sled run. Nour Almamouri, 3, and Ahmad Almamouri, 42, of Portland by way of Iraq warm themselves by the fire. 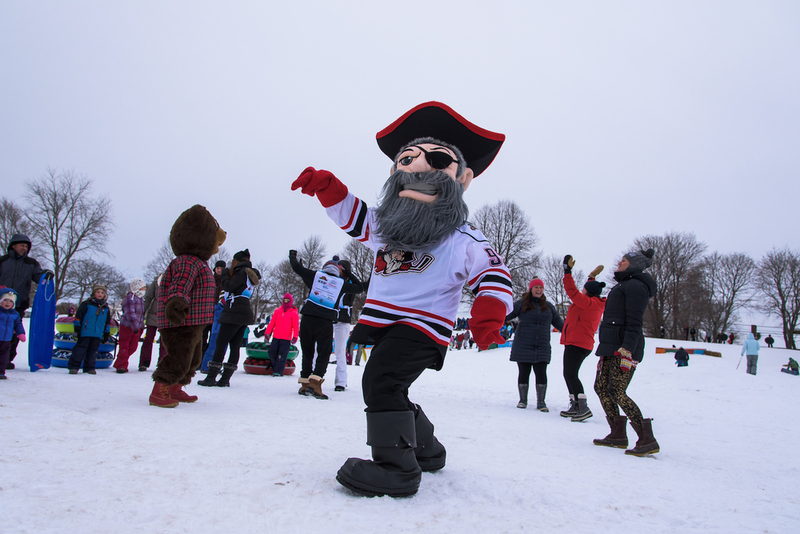 Portland Pirates mascot Salty Pete, L.L.Bear and volunteers from Take Action Portland (TAP) dance in the snow. Nora Lewicki, 7, of Portland partakes in the L.L.Bean Boot Toss. Coast Guard member Monica Stinson, 30, and Jordyn Stinson, 5, of South Portland. Intrepid sledding duo Rebecca Flaherty, 37, and Dylan Moulton, 3, of Scarborough. Tom Doherty, Brooke Burkett and Sheldon Lewis of Camp Ketcha in Scarborough lend ice skates to children and families.